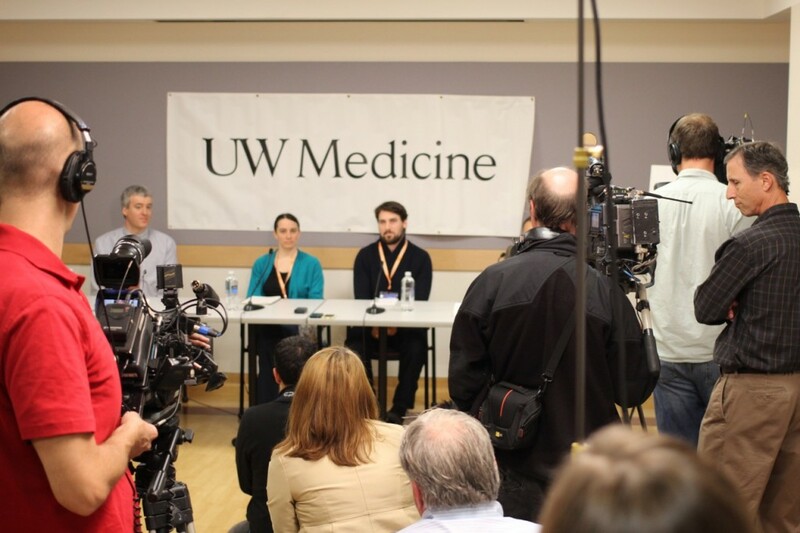 Members of the media clustered around Dr. Francois Aspesberro, Marilyn Schulte, and Dan Schulte (left to right) at today’s press conference at Seattle Children’s. At Seattle Children’s Hospital this morning, members of the Schulte family spoke to the media about the current medical conditions of Karina Ulriksen-Schulte and Baby Elias, the survivors of the DUI-related tragedy that occurred at 33rd Avenue NE and NE 75th Street on Monday, March 25. Dan Schulte, husband of Karina and father of Elias, was joined by his sister, Marilyn, and two of the doctors involved in the care of Karina and Elias. Dan and Marilyn’s parents, Judy and Dennis Schulte, died at the scene. While the community has been able to follow medical updates on Karina and Elias’ conditions on their CaringBridge site, this is the first time that detailed medical information on the pair has been released.